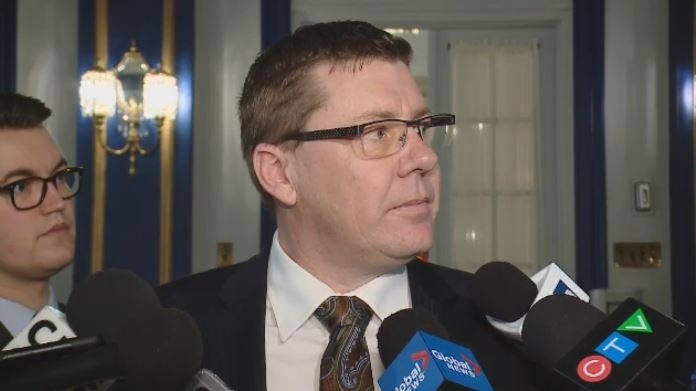 REGINA - Saskatchewan Premier Scott Moe says government members will be choosing their words more carefully after one of his ministers spoke to an anti-abortion group. Minister of Rural and Remote Health Greg Ottenbreit recently told a pro-life convention in his Yorkton-area constituency that he would "continue the fight." Moe says he spoke to Ottenbreit on the weekend and that from now on he will chose his words differently to reflect that he is a minister of the Crown who speaks to government policies. "I think ministers understand that maybe a small line has been crossed here and we should ensure that as we more forward that we are very prudent in doing exactly what we are here to do," said Moe. Saskatchewan Premier Scott Moe speaks to reporters in this file photo.